Sister Margaret Giblin - Serving the Latino Community for More Than a Half-Century! Sister Margaret Giblin explained that Esperanza Center in Fells Point, Baltimore, has temporarily relocated their three-story office to nearby Assisi House at St. Patrick’s, due to damage from a fire next door in September, and continues to provide wrap-around services to the predominantly Latino immigrant community. It is quite amazing that the center was able to get up and running so quickly, providing its full range of services - especially at a time when Esperanza Center’s health, education, employment and legal assistance services are in heavy demand. When Sister Margaret began her ministry at La Esperanza, she worked in the Health Services Center for several years. She now ministers in Education Services, and joyfully effervesced, “just the other day, I made 35 calls in Spanish to remind people of upcoming classes.” As many sisters do, Sister Margaret downplays her role at the Center, calling herself a “girl Friday.” Education Services Manager Diana Siemer, sees Sister Margaret’s ministry differently, admitting she relies on her as she would a full-time employee. “Sister Marg is always here. She is willing to do anything I ask, from teaching, to helping prepare volunteers, to keeping the supply cabinet stocked. She is always giving me ideas. Her perspective is unique,” adding, “it’s a joy to have her.” Esperanza Center has a classroom named after Sister Margaret. Hailing from Chicago, Sister Margaret entered the School Sisters of Notre Dame in 1947 in Baltimore. She received her Bachelor of Arts in Economics from the (former) College of Notre Dame of Maryland in 1949. She professed her first vows in 1950. Throughout the 1950s and early 1960s, Sister Margaret taught at St. John Catholic School in Charleston, North Carolina and then St. Hubert Catholic High School for Girls in Philadelphia, and earned a Master of Arts in History from Catholic University of America in 1964. For nearly the next three decades, Sister Margaret lived and taught in Bolivia. She describes answering the call for volunteers for missionary work in Bolivia, “I said I would – at the time very full of self-righteousness.” Later she revealed, “in the first several months, sometimes I was afraid.” Prior to landing in Bolivia, she took a four-month intensive language class in Lima, Peru. Once in Sorata, Bolivia, her “Garden of Eden,” a small town north of the Bolivian Andes, northwest of the city of La Paz, she and four other sisters opened a teacher training school,” Academy of Our Lady” at the request of the Bishop and taught the girls at the boarding school. She was then called to Colquemcha where she helped open a clinic and a training center. She taught adult education for 16 years - living a “Girl Scout existence.” Her last five years in Bolivia she lived in the small town of Anchyllan, teaching Adult Ed. “Small is beautiful…We were part of these people’s lives… It was the greatest.” When she returned to Baltimore in 1993, she began ministering part-time at the Learning Bank, an adult education/job readiness program and at the Marian House, transitional housing for women coming from rehabilitation programs or prisons. 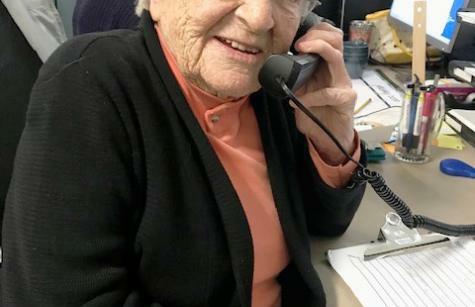 As Sister Margaret reflected over a lifetime of ministry, she smiled when she spoke about her next “dream job” at La Casita Community Center, an outreach center for immigrants in Georgetown, Delaware. She was recruited by friends in 1995 to serve the Latino community and became director for the outreach and resource center for new immigrants, and was instrumental in securing state funds to keep the doors open. “It was so obvious to me that what was needed was an after-school program. It is one of the things I’m most proud. It’s still going gang-busters.” She continued, “I love teaching and it was the closest thing I had to Bolivia in the United States. The people I was serving, I loved them. I lived among them. I went to church with these people, to their baptisms, weddings, funerals – a couple of years after I left, I received a call from a mother whose daughter was turning 18 and she wanted me to be there for her birthday party.” The only way she left was knowing there would be a replacement for her to keep La Casita running. Turning 91 years old in February, Sister Margaret is full of gratitude. All of five feet tall, she is spry and lively with a wonderful sense of humor. She says she keeps an “Unbucket List” - and confided that shingles and a broken hip are at the top of that list!